Julian is a pretty mountain town that makes its living being a pretty mountain town: On weekends the place is packed with tourists on the main street visiting the quaint stores and in particular lining up for apple pies made from local apples. (In the Mom's vs. Julian Pie Co. debate, I vote for the latter.) There are a number of cideries, as well. Julian used to be home to two breweries, but Julian Brewing Co. has been undergoing a renovation and reimagining for quite a long time now and it still has not reopened. That means Nickel Beer Co. is the only brewery in Julian, for now at least. Thanks, Sarah, for being my DD so I could visit Smoking Cannon Brewery and ChuckAlek in Ramona as well as Nickel in Julian. Nickel Beer Co. is owned by Tom Nickel, who has a storied history in the San Diego craft brewing scene. 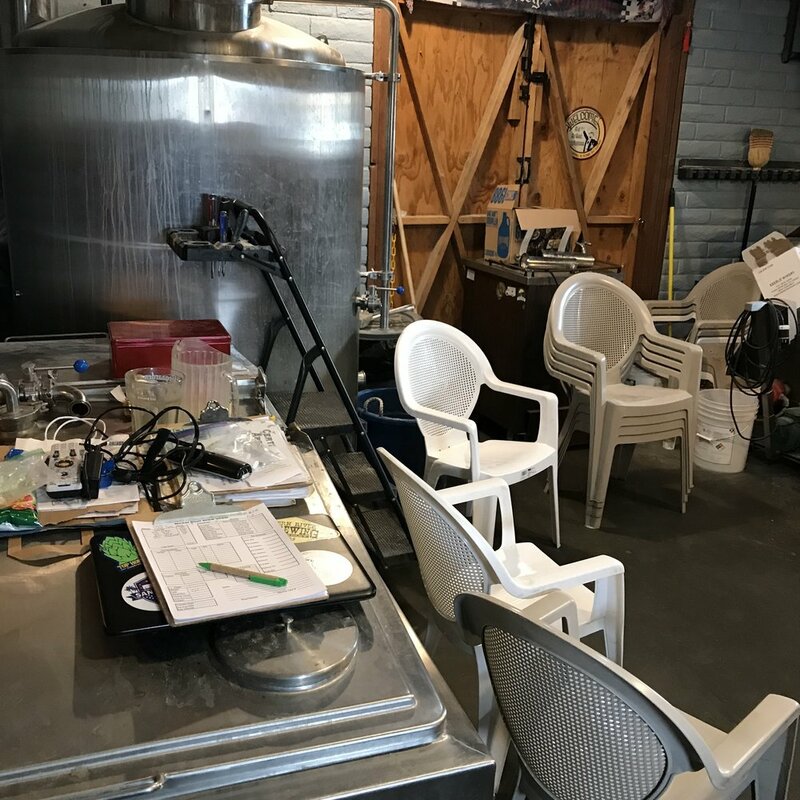 He brewed for some of the local "OG" breweries back in the day (Pizza Port, Oggi's, and even Julian Brewing), and he owns the famous craft beer bar O'Brien's Pub in Kearny Mesa. I had only heard a little about the location, but it lived up to its billing: A small house (shack, really), a large outdoor patio with picnic tables, plenty of customers. I have to say, though, that I was underwhelmed by the beers. Maybe I had just expected too much given the pedigree of the place. While the beer was underwhelming relative to reputation, the service was adequate (quick and informative if not overly friendly), and the atmosphere was active and relaxed. The physical setting is small but okay. Except: the back room where they brew, which you have to walk through to get to the restroom, was like a hoarder's garage, and filthy. The brew tanks, hoses and floors were the dirtiest I've seen in any brewery or tasting room (and this is my 173rd review). There was a thick layer of dust on top of the tanks. The restrooms, just feet from the brew tanks, were disgustingly dirty. It didn't inspire a lot of confidence in the safety and quality of the beer. This situation is very surprising, given that brewers often say that most of their job is cleaning. Overall, I'm not sure it is worth the trip to Julian just to visit this place. If you are here for a hike, a pie, or quaint-town-tourism, maybe drop in. Hopefully they'll get the brew house cleaned up. beer, craft beer, Craft Beer In San Diego, San Diego, Julain, Nickel Beer Co.